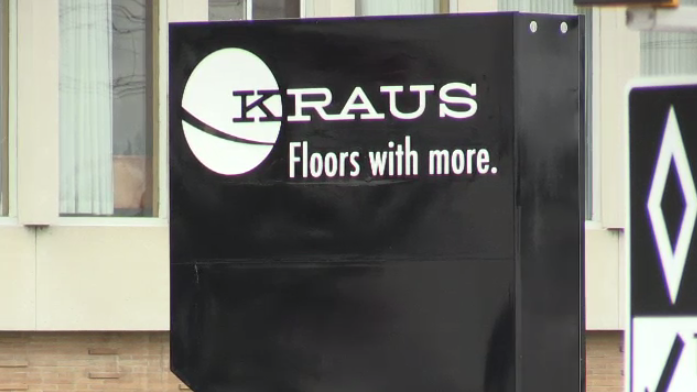 After almost a week of speculation hundreds of employees at Kraus Flooring in Waterloo are officially out of a job. CTV News confirmed Tuesday that the Northfield Drive business is closing its doors for good. The company says due to changes in the flooring industry, 256 people will be out of jobs at the Waterloo manufacturing plant. Its parent company, Kraus Group, announced Tuesday it has been granted protection under the Companies' Creditors Arrangement Act. It goes on to say an agreement has been reached that will see its hard surface and carpet tile distribution business acquired by Q.E.P. Company, which is headquartered out of Florida. Documents filed with the court as part of the process say the group's assets are worth substantially less than what it owes its to main creditors, a total of nearly $148.2 million. One worker told CTV Kitchener late Tuesday morning that they received a phone call from management saying that all workers are being terminated. There was no word at the time about any severance. The flooring company was founded by Michael Kraus in 1959 and remained a family business for more than 50 years. The company was hit hard by the U.S. housing crisis in 2012 and after it was purchased by Hilco, a global financial holding company, employees agreed to a $1 an hour wage cut. "In recent years, the flooring industry has seen significant changes. Customer preferences have evolved and market conditions have impacted our business. We tried our very best to find a solution and look at all options available, including a possible buyer for the whole business, but all those options have now been exhausted," said Shawn Davies, Kraus Flooring president and CEO, in a press release. At the head office in Waterloo, hard surface and carpet tile distribution will continue with distribution sites throughout North America. Workers had been told last week that they were being laid off indefinitely and their final shift was last Friday. Tuesday morning employees got word the layoff is permanent.